Installing flooring materials should not be handled by the inexperienced. Attempting a challenging task like this on your own can produce unsatisfactory results that may affect your warranty and make your investment less valuable. We offer professional carpet installation in Sugar Land, TX, for all carpet products sold at our local store and showroom. Our selection of carpeting includes options from the industry’s most reputable brands and manufacturers. Available in a range of hues, styles, textures, and materials, carpet may be the ideal upgrade you need to enhance your home. Why Choose Carpet Installation from the Experts? Our flooring experts assist clients through every aspect of the flooring replacement process. Not only do they help homeowners select the perfect carpet for any room, but they also provide professional installations for all carpet purchases! 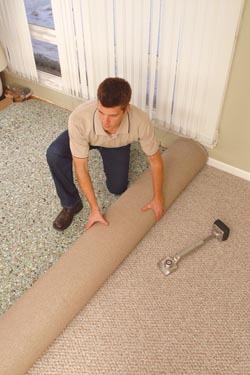 Our carpet installation technicians have years of experience in installing all types of carpet flooring. From the removal of the old flooring, to the safe placement of padding, our technicians are equipped to handle all steps of the install with speed and skill. Every technician on our team also treats the homes of clients with the level of care and respect that they deserve. Our flooring business is proud to provide a warranty that we refer to as the Ultimate Confidence Guarantee. If you are unhappy with the appearance or performance of your new carpet, contact us within 30 days of the initial installation! We will return to your home and replace the flooring with a comparable product completely free of charge. To learn more about the professional carpet installation performed by our technicians, visit our local store at your earliest convenience. Contact us to speak to a flooring professional today. We proudly provide installation services throughout Sugar Land, Missouri City, Stafford, Fort Bend, and Sienna Plantation, Texas.